Paddy Brennan – The master of front-running tactics. Like last year the main thing learned from this weekend was that moving the Persian War Chepstow meeting forward two weeks and pushing the Cheltenham Showcase meeting back a week has left a little bit of a gap, in terms of quality, in the early National Hunt skirmishes. Don’t get me wrong there was plenty of National Hunt racing taking place, on both sides of the Irish Sea, but it just didn’t seem to build as it should have from last weeks Chepstow action. Still, I get why they’ve moved things around, it makes sense not to clash with Champions Day on the flat and it does, I guess, allow us National Hunt lovers to get back on the bridle for a bit instead of just hosing off out front and jumping the fences at full pelt with our eyes slammed shut! OK he was back over hurdles at Ffos Las on Saturday and his two falls on his last two starts last term came over fences but you can’t help but have been impressed by the 7yo’s victory in the Welsh Champion Hurdle. In fact the RPR figures he recorded in victory was his highest over hurdles to date and only 2lbs below his best RPR chase figure. All those conditions were met on Saturday. We also had the added benefit of knowing that Hobbs has his Saturday October 90+ day runners bang fit for the task in hand, with my own October 90+ day trainer guide telling us that that sub-set of his string have returned figures of 15/60 | 25% S/R | +£54.58 BFSP – W&P 32/60 | 53% S/R in the last five seasons. They are currently running at 3/9 | 33% S/R | +£4.07 BFLSP – W&P 4/9 44% S/R for this year. I’m in two minds whether going back chasing is a good idea but in fairness he was still going well when falling at the Cheltenham Festival (JLT) and those 2 chasing falls were over 2m4f and at G1 level. For me he’s potentially best at shorter trips like this race – 101114511111 (9/12) over 2m 0.5f & shorter compared to 2314FF1 (2/7) over 2m1f+ – and those falls may well have been caused by him going over longer trips than he’s entirely comfortable with. That’s far from conclusive though as he has won over 2m4.5f in the past. Whatever the plans are for him going forward (and I do believe it is to go back chasing) it’s was good to at least see his ability and confidence hadn’t been effected by those end of season spills. That’s maybe a bit harsh from me on the 5yo but he hadn’t actually won for seven starts prior to Sunday and he had only even placed once in that time. He had, however, been running in some pretty hot races, including the Champion Hurdle, and at Kempton he was very much favoured by the weights (top rated, receiving upwards of 4lbs from the others), so had he not been victorious here it would have been a worry. Saying that he didn’t win with ease and Barry Geraghty had to get after him a long way out and get down and dirty against Court Minstrel as they made the dash to the line. In all honesty I find him a bit tricky to assess and I’m not sure exactly where he fits into the hurdling picture. I doubt he’s anywhere good enough to challenge the top 2 milers and he doesn’t appear to have the stamina for 3 mile trips. He could be one of those in-between trip types and the 2m4f/5f races may be where he’s best aimed at this season. Only problem with that is that there aren’t a great many of them, at the top levels anyway. 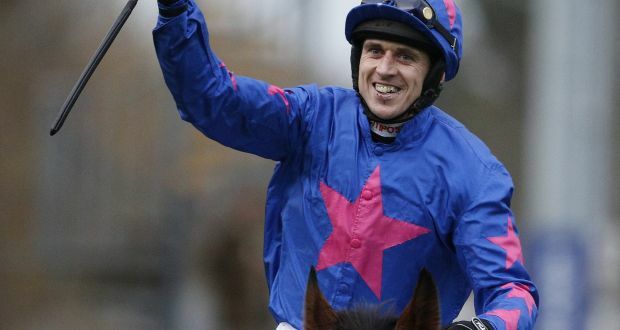 Paddy Brennan is, for me, one of the most under-rated jockey’s in the weighing room. Tactically I think he is right up there with the best around at the minute. Amazingly he only had three rides this weekend but he booted one of them – Viens Chercher – home in fine style with a typically confident and aggressive (controlled aggression) ride off the front end. It was only a three runner race but the fav, Blue Heron, started as 1/2 red-hot fav and was expected to get his chasing career off to a flyer. Paddy thought otherwise though. He knew that one was coming back off a 555 day break, he knew it could be a tad rusty, he knew connections wouldn’t want to get into a battle, he knew the 1/2 fav was there for the taking! And take it he did. He set out his stall early, grabbed the bull by the horns, fired his mount out front and said ‘come on then Blue Heron, catch me and pass me if you can‘. He couldn’t. Brennan had set a scorching pace, he left no hiding place and scooped the race by a comfortable 8L. The simple facts are that Paddy Brennan is dynamite on a front-runner! And his stats back that up. Thing is I think he’s still improving on front running chasers! Yep the National Hunt game is just about to unleash it’s full glory upon us!! If your not familiar with my work there are some excellent examples for you to check out by clicking on the button above. I look forward to seeing you in the NTF Members Area for comprehensive coverage of the 2016/17 National Hunt season. I see paddy Brennan isnt booked to ride gods own in the old roan chase,a p heskin is booked even though Brennan as at least one ride at aintree so far.can trainers who have a jockey booked at the 5 day stage simply change jockeys at the final decs unless circumstances change I.e. booked jockey Is ill for for example. Heskin now number one jock for Tom George so he gets all the main rides for the yard. Not sure the exact politics of that move but it was a bit of a surprise to me as the Brennan/George partnership were always a fruitful one to follow. Jockeys can be changed at final decs stage but unlikely this one will be (unless injury/illness).